Hello everyone, Martha Lucia here with you today! I was inspired to create this with the monthly mood board that is normally used on Kennedy Grace Blog. 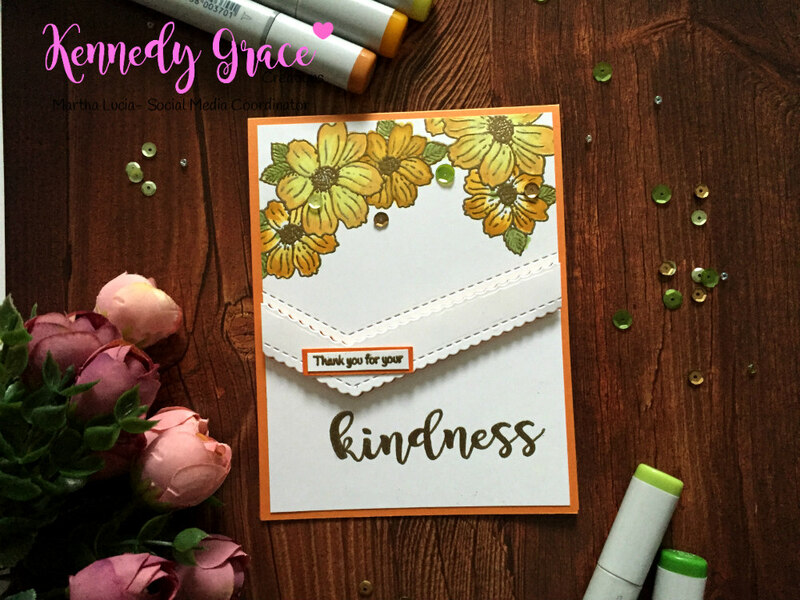 This offered me the colors of fall season and as you know the yellow flowers are my favorites so I started working on this project by stamping the flowers from the set Kindness Medley using in clear embossing ink or Versamark onto whisper white cardstock. 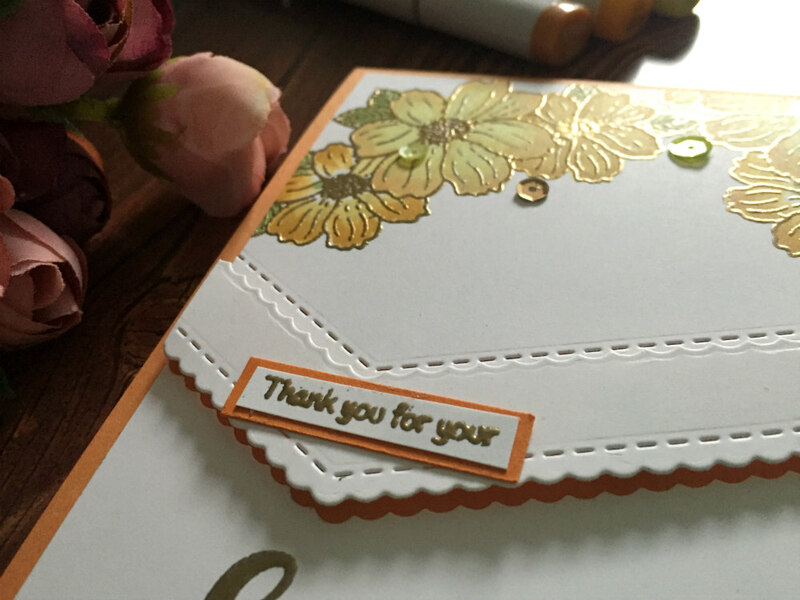 I used my MISTI stamp positioner to help me get a nice crisp impression. 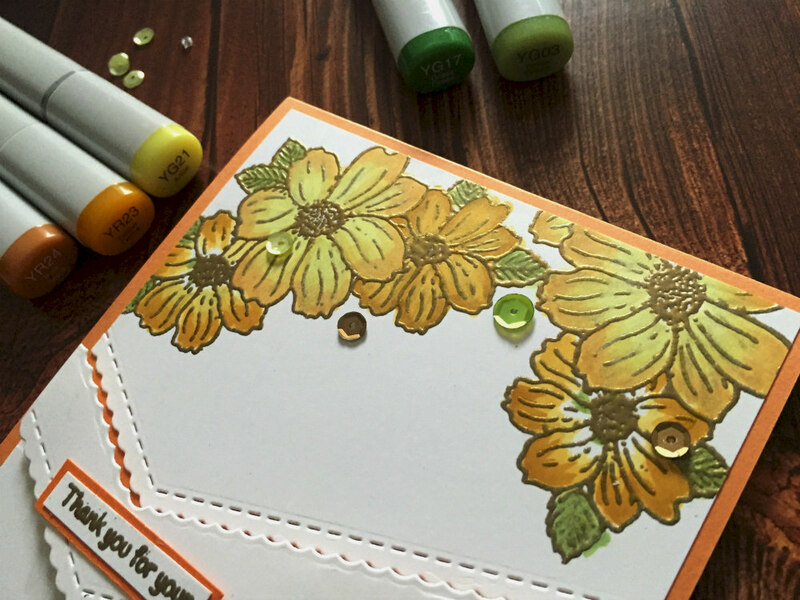 Next, I covered the entire stamped images with Gold embossing powder and heat set it with my heat tool. To add a pop of color to these images I used my copic markers in green and yellow colors. I used YR23, YR24, YR27, YG21, YG03 and YG17. This process takes a bit of time, but I think the result is well worth it. Over the same panel I stamped the Kindness work following the same process and in a separate piece of whisper white card stock I stamped the tiny message that then overlaid in a Peekaboo Peach piece of card stock. I trimmed my colored panel to 4 x 5 1/4″ and die cut under the flowers using one of the Die-namics Stitched ScallopBasic Edges from My Favorite Things. Then I pasted the upper part directly onto an A2 Peekaboo Peach card base. 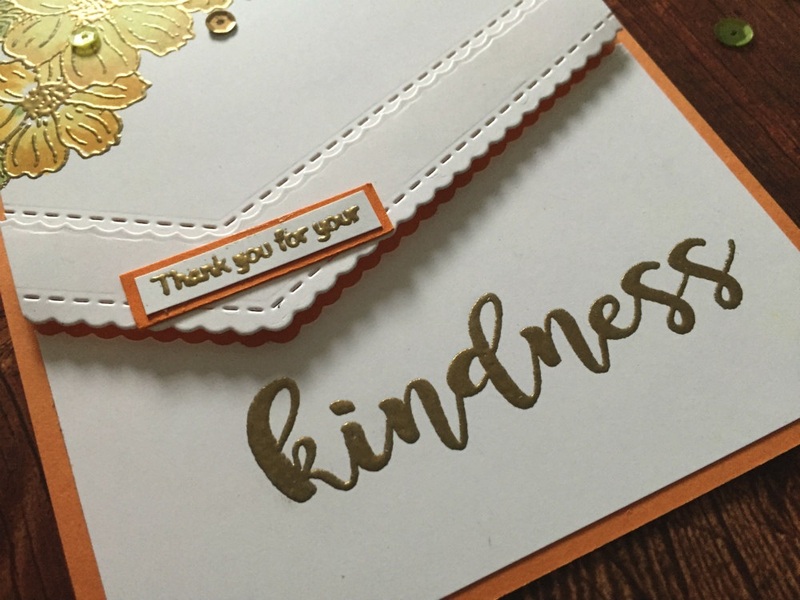 Using the same die cut, I cut a second piece from the same whisper white layer to create a dimentional pieces and pasted the kindness part onto the A2 Peekaboo Peach card base and foam mounted the additional cut. To embellish the card I added some sequins from the Enchanted Evening collection from Kennedy Grace, only on the top part and some over the flowers. This is the mood board for October in Kennedy Grace Creations and I would love to know what you think?